We’ve raised funds with BBQ, Wings, and Italian fare – we’re keeping it light this time with soups, salads, and sandwiches! We’re teaming up with Panera Bread at Southland Mall in Hayward for a fundraising night to contribute to our building maintenance funds. We’ve succeeded in repainting our 118-year-old Southern Pacific Depot and now we’re looking to do some plumbing upgrades, resurface our front deck, and more. On September 29th between 4:00 PM and 8:00 PM present our fundraising flyer to the kind folks taking your order and, so long as they receive at least 20 flyers, they will make a donation of 10-20% of qualifying purchases to the San Leandro Historical Railway Society! The more flyers, the better – if they receive 20-30 flyers, we’ll receive 10% of your purchases as a donation. 31-49 flyers increases the donation to 15%. If they receive 50+ flyers redeemed then we’ll get a handsome 20% donation! We believe we can do it – with your help! Only one location of Panera Bread is participating, so make sure to hit up the Panera Bread Bakery-Cafe at 24133 Southland Dr. Southland Mall Hayward for a late lunch or light dinner between 4:00 PM and 8:00 PM only! You can download the flyer here – please share it with your neighbors, friends, family, co-workers, perfect strangers, anyone! 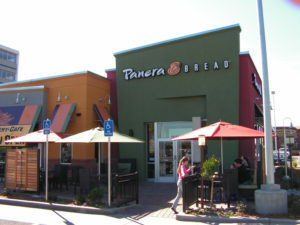 Panera Bread makes it easy and allows you to either give them a printed flyer or show them the flyer on your phone. As mentioned, at least 20 flyers need to be redeemed or else there will be no donation to the Society, so we would love for everyone to share this fundraising event to help us out! Won’t you join us on September 29th for this fundraiser?